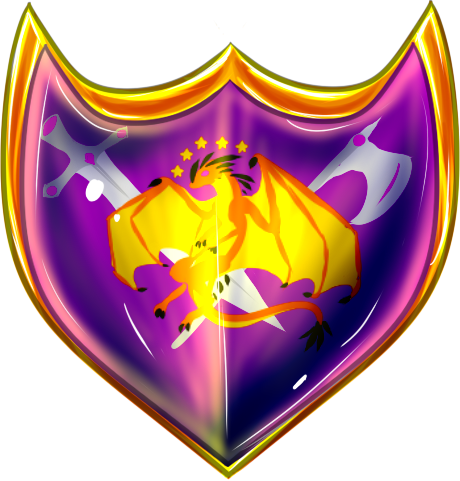 Vystriana will forever be the central hub of dragonkind, ruled by Queen Verridith and her Council. A land of beauty, it is often the target of many who would seek to claim it, and has been the bed of many a war and skirmish. However, it has an uncanny ability to heal itself, and restore the abundance of its nature beyond many, and is well protected by the draconian guardians who call Vystriana their home. However, dragons are not the only creature in the land; many other species have chosen to make this country their residence, and it has become a veritable melting pot of races who live in harmony with one another. In it lay several areas of great historical or religious importance, such as the Bloodstone, the Cavern of the Gods, and the Temple of Nossa'rin. 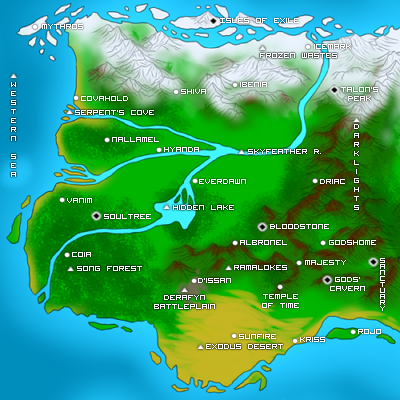 These are the cities found within this area; each one is marked on the map, and divided by tiers. The larger the tier, the larger the city - tier one may be a small village or town, while tier four may be sprawling cities of grand proportions. RACE: mixed. LEADER: Archmage Darius. TIER: unclassified. APPEARANCE: The Valley of Godshome doesn't hold a city; instead, Felnova's great Mage Tower rises to throw shadows across the rolling plains and thick forests, a colossal monument that promises protection and guardianship over all who live in its domain. A silver river cuts a ribbon through the grass, flowing past the Tower from the mountains; it ends at the far end of the great valley into a crescent-shaped pool, one said to reflect the moonlight even if there's no moon to show. Three quarters of Godshome is surrounded by massive, towering mountains far too high to fly over; outside of these mountains swirls a gigantic tornado with winds that never stop. As its sustained by magic, those within the valley don't hear its incessant howl - nor do they feel its tearing claws. Only those blessed by the mages may enter or exit it, or those fliers crafty enough to find the hidden passageways through. The Tower is as old as the many carvings found throughout the mountains, filled with ancient energy and countless mysteries. Protected by the mages, it appears to an outsider to be in ruins, intricate architecture spent and corroded away by time. Its gates are enchanted to make those who approach forget what their purpose was, and leave without trouble. In reality, the Tower is a beautiful structure that reaches for the sky, the blues and greys of its stone offset by patterns of sandy browns and golden tans set into carvings that span the breadth of the walls. Inside, it opens hollow into a vast colosseum, its original intent abandoned to make way for a training ground for many who wish to learn the art of magic. Its walls house rooms big enough for a grown dragon to fit neatly into, and flow through their encasement to the very top, save but for one room that lay at the center of the Tower's tip. Suspended over the great colosseum, the ranking master - usually an archmage or sorcerer of high esteem - resides here and gives orders that govern every level of life inside the Tower. Beautiful and strong, Godshome remains one of the most astounding and mysterious places in Felnova today. RACE: dragon, mixed. LEADER: Queen Verridith. TIER: four. APPEARANCE: The Arched City is a massive monument to the craftsmanship of many races; dragons, elves, dwarves and even the Alubrian gryphon partook in its making, shaping the seamless white marble into towering walls and beautiful archways. A thick curtain wall surrounds the central part of the city, protecting it from harm - within the marble lay spells of protection against destruction, as well as deeper spells even unknown to those that dwell there today. Beneath the intricately-carved Great Arch, where ends the North Road, sprawls a courtyard in front of the Great Hall, where a fountain shaped in the likeness of Time spits water into a gleaming pool. The rest of the city is filled with vast bazaars, soldier barracks, inns and stables; the training grounds, the landing field and another market located on the eastern side. The opening that leads down into the subterranean dungeons is near the landing field between the soldiers' barracks and the great grassy expanse itself. Inside the keep, there is the Great Library, the Hall, a sickbay large enough for great dragons to be tended in; a training hall where mages may teach their apprentices and where knights may learn the ropes; and of course quartering for any and all, including the royal lineage itself. The Great Hall as mentioned before is a startlingly large room filled with pillars that stretch for the ceiling, a statue of each draconic king and queen placed at intervals along the wall. Near the far end is a giant statue of Kazule, his scales done in a thousand different gemstones, all five heads arched to peer down at those who stand before the dais and the dragons' throne. Behind this, there is a war room - and from there, access to the treasury may be found. CULTURE: As culturally diverse as Albronel is, led by dragons yet filled with many more, they still celebrate many of the same holidays passed down from Millirand; the great Tournament is held mid-summer each year for the Order to both test its skill and give entertainment, while the magi of Godshome come in the winter to perform many feats of magical skill. They celebrate the Day of Bones, and the Day of Giving; age-old traditions passed down by dragonkind and well respected by all others who live there. RACE: drow. LEADER: the Authoritarian Council (NPC) TIER: four. LANGUAGE(S): Drowish, Common. ALLEGIANCE: Vystriana. APPEARANCE: D'issan is the second largest settlement in Vystriana, a provincial state with its own government and laws eclipsed only by the Vystrian queen herself. A subterranean city located beneath the Derafyn Battleplain, it nonetheless keeps and captures the elegant beauty that any aboveground elven city holds. Built with smooth obsidian and black marble, the towers and spires of D'issan stretch towards a cavernous ceiling miles above, one dotted with skylights and gemlights that mimic the stars outside. Uniquely crafted, the skylights also act as drainage for rainwater, directing it into shaped gullies and pools. The falling water creates a spectacle every time a storm comes overhead, catching the light from outside and the gemlights within to create mesmerizing rainbows in a play of many different colors. Though the streets are somewhat narrow, most of the buildings open into them, wooden doors of polished oak and maple. Few roads and pathways descend into tunnels beneath a great Grand Keep and its corresponding tower, where the Authoritarian Council holds its power. Near the decorative gates, carved with images of both Balion and Scylla, that lead into the Derafyn there's a wide courtyard of black stone and a fountain carved to resemble intertwining dragons in a battle for their lives. To offset the fountain's inherent rage, flowers of a rare plant twist and twine around the great stone drakes, glowing like miniature moons in the dark of the night. CULTURE: The drowish stronghold is governed by the Authoritarian Council, a rather corrupt group of dark elves who hold absolute and unrelenting power over their citizens and soldiers. Slavery is commonplace beneath the vaulted ceiling, though none are particularly mistreated. Their military is very strict and so are their laws - any drow caught breaking a rule of any kind faces threat of exile, slavery, not just a spell in the stocks. On the topic of festivals or celebrations, the passing of a particular training squad's Test generates much cheer, and they worship both Balion and Scylla in equal regard. RACE: human. LEADER: Lord Tefla. TIER: four. APPEARANCE: The city of Ibenia is a citadel built into the side of towering, ice-capped mountains; with grey stone hewn from the cliffs it settles against and within, the outer wall and its courtyard reach partway into the valley that spreads before it. Above are three towers, the middle - tallest - joining with the cliffs a few hundred feet above the ground. The two that flank it are set nearer the wall, the western slightly taller than the eastern. Merchant's tents line either side. Behind, the city descends into the cliffsides, built in tiers inside of the mountain itself. The foremost rooms have balconies and windows, while deeper halls are lit with mage-stones and torches. In the darkest depths of the mountains lay Ibenia's sprawling dungeons; a labyrinth of sealed, utterly-lightless caverns stretches for miles deep underground. These caverns are veined in a porous, unnamed mineral that emits a strong hallucinogen, contained within the seal by a number of ancient spells. Utilizing this mineral, Ibenians often will sentence criminals to death by placing them in the deepest depths; many will kill themselves through sheer terror alone. For more minor offenses, there are chains to hook offenders to near the only opening, lit by a series of golden mage-stones. Ibenia is also protected by a paling - a barrier of energy commanded by skilled sorcerers and mages, constantly rotated as to not cause exhaustion. This barrier is nearly invisible, appearing as a sort of soap bubble around the entire city, tinted blue in the light. When stricken, ripples of many colors flow in every direction. It can be opened or closed on will. CULTURE: Ruled with a strict hand, Ibenia has little tolerance for disorder. Criminals are swiftly punished, and any error on the part of a leading figure - such as the monarchy of Vystriana itself - is met with uniform distaste. To the citizens, Ibenia is welcoming, but outsiders are quite often shunned from the gates. Compassion has faded over many long years of solitude in the far north. Festivals include a single, week-long celebration of Leartes, god of Peace and War. RACE: Icemarkains, humans. LEADER: Moraose (NPC). TIER: four. APPEARANCE: Locked in a land of ice, the Mark is a stronghold in Vystriana's great north. Built with strong granite and gneiss, the city is a sprawling settlement spread across rolling hills covered in permafrost and snow. Backed up to the mountains with a valley spread out before it, Icemark holds ownership of much of the northern wastes, sending its patrols of ice dragons and wolves far and wide to keep watch over the vast countryside. As such, those that dwell within are strong and hardy, mostly human warriors and those with a desire to learn more of survival and the Mark peoples' sturdy ways. CULTURE: Once ruled by a great black dragoness named Ayla, Icemark celebrates a day in the peak of winter in her name. As such, black dragons are revered because of her; very rarely will one of another color garner such attention. They trade animal furs and food, medicines and weapons made of bone, bronze and steel, all to outsiders who brave the icy snows, escorted by their warriors and dragons through passes known to few. An outgoing and wonderful people, those of the Mark are always happy to have visitors at any time of year. RACE: dragon; mixed. LEADER: Priestess Kokira (NPC). TIER: four. APPEARANCE: Time's temple is a large, rectangular structure crafted of iridescent bismuth, adorned with a statue of Time at its zenith. Four large spires rise form the temple's corners. Within, there are numerous large alcoves, within which are floating spheres representing each of the Realms that rotate according to the passage of time upon them. Realms subject to shifting time fluxes rotate faster or slower, as appropriate, allowing Time's priests and visiting scholars to observe the passage of time. CULTURE: Time's Temple is a place where silence reigns, and voices rarely rise above gentle murmurs and hushed whispers. Calming music pervades the Temple, but other than that, very little is heard. The priests and priestesses warn travelers and pilgrims against loud noises, for silence is often needed to study the intricate passage of time. RACE: primarily elf. LEADER: Queen Skyesyght (NPC). TIER: three. LANGUAGE(S): Elven, Common. ALLEGIANCE: Vystriana. APPEARANCE: Gates lined with reflective river-pearls face out towards the water; a bridge of polished wood and hard marble allows entry for those crossing its rushing rapids. The walls that spread to either side of these gates are carved to resemble wings, with thorny vines bespelled in such a way to detail the lining of the feathers. The trees growing along the river's edge help to keep the boulder-studded banks solid, their roots grown deep into the ground. Within, an orderly assortment of market-buildings and bazaar stands flank a smooth-marble courtyard, a fountain in the middle shaped completely with polished gemstone and opalescent pearl. The backdrop is carved in a likeness of the sun, and it's said that the pearls in it continue to glow even after light has faded into day. Behind it, a great keep rises, formed of stone and a tall, leafless and curled white tree. Houses are built behind the city's firm defenses, white marble with pearls studded into every thick wooden door. CULTURE: Since the destruction of the Human Realm and the arrival of many human refugees, Everdawn has all but discarded its wariness of others. A cheerful, open city, it welcomes all to its beauty and hospitality, and remains one of Vystriana's most capable towns. It is blessed in trade and rich in crafts, arts and the arcane workings of magic. Like Vanim, the elves of Everdawn worships Balion as well as Scylla, and a temple to all the Five lay in the forest just outside of the city's gleaming walls. RACE: elf, human. LEADER: Lord Belahaus (NPC). TIER: three. LANGUAGE(S): Common, Elven. ALLEGIANCE: Vystriana. APPEARANCE: The city of Hyanda is large, but cluttered and densely populated due to the land around it being ill-suited for construction . It is clearly a city dedicated to the art of war; the walls are made of brass and silver, and the buildings are constructed of logs and easily rebuilt in case of attack. Beyond that are the people themselves; many dedicate their lives to blacksmithing and teaching the skills of battle. Hyanda is a city that many journey to in order to learn skills that have been honed for many, many generations. CULTURE: There are main holidays the Hyandians celebrate. One of the most important is a fighter's festival in which all are allowed free training in whatever they wish. The people of the city are not very religious, but many do worship Leartes for his affinity to war. In general, the people are violent and ferocious, especially towards outsiders; children are trained from a young age by their parents, and it is not uncommon for street brawls to break out multiple times a day. The city is notorious for sheltering shady characters, however unintentionally. RACE: elf. LEADER: Lord Gilthanus (NPC). TIER: three. APPEARANCE: The closest of the Vystrian elf dwellings to their cousins in Evylon, Vanim's spiraling pillars and purest white marble seem to reach to claw the sky; the trees closest grow just as tall, their branches drawn to the inner light of the central spire. Other spires touch the flowing curtain wall, and mark many things within. Buildings will have one of the spires set in the corner of a wall - others may be set on either side of a doorway, or within to line a fireplace. The architecture here flows more than Heartwood's more crystalline appearance, more fluid than not. Wherever the flowing pathways don't touch, greenery abounds - from flowerbeds to tall trees to vines that crawl upwards along the pristine walls, the elves take great pride in their connection with nature and strive to keep its beauty pure. CULTURE: Though more outgoing than the drow of Coia, these Vystrian elves aren't fond of untoward visitors; they've ejected many at their gates. Refugees, however, are always cared for, and it is policy that those with greater needs be seen before their own. A merry folk, the people of Vanim praise Balion for his connection with nature, and hold festivals each year in his honor. RACE: drow. LEADER: Lady Lealanii (NPC). TIER: two. APPEARANCE: The drow of Coia were the first to come from Evylon; all of the elder line, they were reluctant to leave the beauty of Heartwood behind them. Trees fill the vast stone city, coiling inbetween the buildings, roots stretching underneath the streets' flat cobblestone. Beautiful, towering sycamores and slender pines surround many of the houses, and soft green grass carpets the city everywhere, save for the serpentine roads. Built with white stone and seamlessly smooth, polished wood, the high walls of this elven city reflect influences from Heartwoodian and Halgian architecture. The buildings are elegant and wonderfully made, a testament to the builders' skill as artisans. Statues of fantastic creatures such as gryphons and dragons line the streets and fountains can be found throughout the city. CULTURE: Incredibly wary of other races, Coia holds a strict guard on their closed gates; none may enter save for those blessed with the approval of the drow. Their mistrust is that of a wronged people - many of the citizens still hold their banishment from Evylon strongly in their hearts, and will permit no Heartwoodian elf to walk underneath their trees' thick boughs. Though a quiet city, Coia holds celebrations for Scylla thrice every year. This marks a festival for when trade is rich, and the only time they'll freely let others enter their beloved city walls. RACE: human, dragon LEADER: King Nwilterra (NPC). TIER: two. APPEARANCE: Majesty was a once-proud haven to dragons; built between the towering peaks of the Darklights, this dark-stoned city has been labeled the complete opposite of Albronel. Located in a canyon and protected against floods and the occasional winter glacier by old, towering stone levees, Majesty's history dates back to the time of the first serpent war, where it was built as a secondary stronghold that was never used to its full potential. Abandoned by the dragons after Albronel was retaken, a clan of humans found it and built on it, turning the city into what exists today. The air is gloomy and dank; filled with the stench of rot and decay, most choose to stay indoors. The walls now grow moss and the streets forever lay in disrepair and littered in refuse. Majesty isn't a fortress-city like most larger Felnovian settlements are; it has no curtain wall. The homes are made from the surrounding black and dark-grey stone, thatched in ash-colored timber. Backed up to the eastern cliffs and near the corner of the northern levee lay the current King's citadel, its dark towers looming above like a watchful vulture. CULTURE: Led by a stern, almost cruel, leader, Majesty holds little in the way of celebrations. The taxes collected by the King's sheriff hold the people in a constant state of poverty and malcontent - yet few can stand against the one who protects them from the wars and terrors of the outside world. Cut off from the rest of Vystriana, Majesty's roads are guarded, open to brief wayfarers and merchants - and none other who wish to go nor stay. RACE: mixed, dragon. LEADER: Jae'rendal (NPC). TIER: two. APPEARANCE: Mythros is the last outpost of Vystriana, high up in the north, as well as the city furthest west. It began as a simple trading post that grew into a respectably-sized city; many who do not mind the cold come here to barter goods that can be found nowhere else. The fierce blizzards abate here, for some reason, and the air currents above the ocean form a natural pathway here; many dragons and gryphons traveling from continent to continent stop here, in this unusually warm Frozen Wastes city, to rest and hunt before winging their way south to the main body of Vystriana. The city was founded by arctic kitsune, but they have all since disappeared for reasons unknown; in any case, dragons found the abandoned shell and rebuilt it. A stone obelisk stands in the centre of the main square as a memorial to the kitsune that once lived here; many speculate that it is because of their lingering magic that Mythros is so air-accessible and livable. The log longhouse that forms the main building of the city houses non-dragon travelers, and also plays host to four stationary gate-portals; these allow access to and from Everdawn, Abronel, Covahold, and Icemark. CULTURE: Four times yearly, a trading day is held in which merchants and traders offer their wares for lesser prices than they would normally; the snow is melted away and werelight is placed in all the trees and on the buildings like brightly-glowing fireflies. It is a festive time indeed; troubadours arrive through the portals to provide entertainment and storytelling through the night, and younglings of all races are given special treats such as candied apples or tender braised rabbit. RACE: elf. LEADER: Lorein (NPC). TIER: two. APPEARANCE: Nallamel, at first glance, appears to be nothing more than a densely-protected orchard; the dozens of fruit-bearing trees are surrounded by a thick growth of thorny vine, gorse, and fern; these barriers were put into place long ago by the elven mages that first settled here. However, hidden in the roots of a massive oak tree in the centre of the grove is a pathway underground, to the true city. The archway that leads into the earth is just large enough for the tallest of elves to slip through; as such, many of the larger creatures such as most dragons do not enter into the city by conventional means. The tunnel leading into the city is a further defense; it twists and turns and divides into dead ends. But the actual city is rather cheerful for being underground; a subterranean spring feeds a river that runs through the city, and the elves` flameless lanterns provide a warm glow. In addition, they have simulated sunlight by means of advanced light spells that activate during the daytime; as such, among the stone houses grow many varieties of plants. CULTURE: The elves here uphold healing by magic and herbs as an art, and are devout to the Five, religious qualities not found in many other Vystrian elfkin settlements. Every month, a day of healing is celebrated by means of a large, fun festival in the town`s central square, followed by a colossal feast and displays of talent in song and verse. RACE: werewolf. LEADER: J'kacle (NPC). TIER: two. APPEARANCE: Sunfire is a haven in the desert, sheltered by a surrounding bank of sand that rises like waves on three sides. Protected by these dunes, an oasis grows sleepily in the desert heat, cholla cactus and juniper trees mixing with the tropical palm and imported cottonwood. With but a small spring for water bubbling up within a carved stone basin, decorated with images of wolves, Sunfire builds its homes and buildings in accordance to the movements of the sun. Each is crafted from thick sandstone resilient against the oppressive heat; the city forms a semi-circle around the market square, a great stone wolf siting beside a snarling worgen standing at the center to greet weary travelers. The statues are built with grey stone, and the same spreads outward in a fan, cobblestone mixing with the desert's reds and tans the further away it goes. Instead of straw, their buildings are thatched in wood, some with bands of nailed metal across the top to reflect away the sun. CULTURE: The city of Sunfire has always celebrated the birth of the wolven gods, Cirrus and R'rkain, at the very beginning of winter each year. Though not directly related to the Vystrian wolves at all, a few loners have integrated themselves into the werewolf society, and both species find comfort in walking alongside one another, be it human or wolven forms. Ruled by a strong black worgen, the citizens are wary of those holding no canid blood, but are welcoming to any who need Sunfire's protection. Though untamable even by the dragons, they swore allegiance to Exodus long ago, and continue to serve Vystriana to this day. RACE: primarily human, kaveri. LEADER: Sir Noculas (NPC). TIER: one. APPEARANCE: This single-tiered little town is located on the edge of a cliff overlooking the vast Western Sea and the marshlands that brush Serpent Cove. A smattering of small, straw-thatched homes and a wooden bailey that houses a ragtag contingent of the Vystrian army, Covahold is a homely little town with welcoming people, fisherfolk and able craftsman. Along the northern side there lay an ancient stone wall, broken down in many places, once said to be a part of an old castle that took the place where the bailey is now; the keep and courtyard have long been destroyed. Now, the twin wooden keeps and their sharpened-log walls hold the birdfolk of the kaveri, a few scant dragons, and a small squad of Vystrian knights. CULTURE: The kaveri that have settled themselves in the port beneath Covahold's cliffside dwellings, dubbed Cliffport, hold many ceremonies, generally those to honor one of their guard or to celebrate the hatching-day of an important official. Though their culture differs greatly from the simple people above, they've integrated well and bring trade and prosperity to many. RACE: dragon. LEADER: none. TIER: one. APPEARANCE: Driac is a dark, damp place, and can hardly be described as a city so much as a network of caverns and tunnels on the edge of the Darklights. Rats and other vermin run unchecked, and many dragons here keep to themselves. It is a broken place of wounded souls; a place of outcasts and misfits that belong nowhere else. Many come here just to hide from the rest of the world until it is time for them to move on; some never leave, and pace the dark tunnels ever after, lost in miseries both imagined and in the past. It is a place of mourning; it is said that the scales of those who come here eventually darken and lose the brilliant sheen the dragon race is known for. CULTURE: There are no celebrations here, nor any customs to speak of. It is not uncommon for one to never see another inhabitant on any given day; the tunnels are silent for the most part, and no dragon seems to have the energy to spare for even a friendly conversation with another. RACE: various. LEADER: N/A TIER: one. LANGUAGE(S): mainly Common. ALLEGIANCE: Neutral. APPEARANCE:Kriss is only a modicum more advanced than its sister village, Rojo. More of a stopover than a proper settlement, most of its business is in pubs and inns/taverns with stables to house mounts, as well as mercenaries seeking to help protect caravans. As such, many of its ‘buildings’ are really sturdy tents and stalls that can easily be cleared out where a new temporary owner can take over quickly - all save for the port that sees off the ferry to Rojo and Sunfire. CULTURE: Northwest of Rojo on the edge of the Exodus Desert where the water meets sand, Kriss is a town that is a crossroads for various merchants seeking to do trade with Rojo and Sunfire, as well as help supply the Temple of Time. It is a stopover where caravans can restock or take the ferry to the Island of Rojimbo. Most of the talk in the town is regarding business between merchants and with those seeking to buy supplies in bulk, such as those who come from the Temple of Time or Sanctuary Valley. As such, it can both be considered devoid of culture as well as a melting pot considering how many paths are criss-crossed in this tiny town. As it is so small, wells are used for its water supply, as opposed to irrigation. RACE: human. LEADER: Lord Woede (NPC). TIER: one. APPEARANCE: The small town of Rojo is a jumble of small huts and straw-thatched cottages located on the Island of Rojimbo. South of Vystriana, a ferry runs between the city and the mainland, providing trade and any goods the small town needs. Despite the homely appearance of Rojo's buildings, it's quite clean, and the roads are well maintained. As a primarily crafting and farming community, the city square is always bustling, and the fields are always full. CULTURE: Rojo's livelihood is based and focused on its trade. Cut off from the mainland, the ferry that runs is its most important asset; through this, they hold a direct trade route from Sunfire, and send caravans to the bigger cities of Albronel and D'issan. Well known for their trinkets and jewelry made from bright gems and rocks, accented with sea shells and coral, they attract many who come seeking their work from all over Felnova. RACE: human, dragon. LEADER: tribal council (NPCs). TIER: one. APPEARANCE: The township of Shiva is a small village located in the frozen forests of Vystriana's north. It's a collection of round huts of varying sizes, generally with straw roofs and wooden walls. Around many of the older homes, strong - and quite tall - stone walls have been erected as a shelter against the constantly-blowing northern wind. Settled in something of a valley, the trees grow closest together near the southern rim. To the east lay a labyrinth of caves across the treeless path of a glacier, marking where Icemark's mountains begin. CULTURE: Led by a council of dragons, the local populace is a mixture of world-weary humans and old drakes now unfit to fight. Most of the people are wary of magic; the ones who lead them strictly control its use, and believe any large use could lead to rebellion. Within, there lay a conflict of agreement between human and dragon - where one sees magic as something never to be used, others believe it to be good for smaller things, if not larger jobs. It isn't uncommon to see two of these differing species shouting at one another in the streets. Tall as the mountains it stands beside, this monumental gemstone reaches for the sky and towers above any and all. The Bloodstone is a massive, deep red crystal with three faceted sides, smoothest near the top, its bottom rough, darker and rocky. In the sunlight, the stone gleams with reflected light, throwing red rays back onto everything around it. In the fields that surround its scarlet majesty, chunks of the Old Bloodstone lay here and there, for the original was shattered and later restored by the hand of the gods. Flowers grow year-round at its base, and at both dawn and dusk runes may be seen flowing deep beneath its glittering surface. The Bloodstone is sacred to dragonkind and the entirety of Felnova for its history; it's also rumored to be a place where Felnova's reiatsu itself brushes the surface of the world. Fankorialstrazanite, the King before Verridith, once met atop the gleaming Bloodstone to hold a War Council away from the besieged city of Albronel. Here, they were able to divine a strategy to end the war - and free all from under the serpents' evil reign. The Darklight mountain range has long been called Vystriana's backbone. Noted as the dividing line between the dragon's country and the Myrlands, these towering mountains stand sentinel above the two countries, a no-man's land of dark stone and tall trees. Though officially claimed by the Vystrian dragons, none yet have discovered all of its secrets, and thus is it a haven for those seeking refuge from the kingdom's law. Among the snowcapped summits lay Talon's Peak, the fabled mountain where many of the royal linage held meetings to discuss various war plans away from the eyes and ears of the public. Beneath this hallowed peak is the Marker, protected within Zacyn's Cavern. Once the site of a terrible battle, the Derafyn is a place of lifeless bones and ash-grey sand. Death and decay reign in what was once a beautiful place to the south of the Ridge - the scars of a battle where Deathwing and Snakra waged war against the dragons hold such deep enchantment that anything venturing within is sapped of energy, their life slowly sucked away. The skulls of many animals litter the silvered sand and the husks of old, dead trees reach gnarled fingers into the sky, as if pleading with the gods for life once more. Beneath the Derafyn lay a jewel like to few others; the city-state of D'issan, land of the drow, lay buried far within its depths. Exodus Desert once had another name, one that's no longer used; it was once called the Unal'aekin Sands, its meaning lost in the passage of time. Easily the harshest place in all of Vystriana, few make this their homes. The city of Sunfire is protected from the worst of the sandstorms, and the desert's unrelenting heat; not many make it through unscathed, even with the aide of the Desert Golds who dwell there. Each year, it claims more lives; those who do not respect the desert learn to know its rage. A beautiful, harsh land in the middle north of Felnova. Mostly tundra and permafrost, not much grows here, although the land is largely populated with werewolves and ice drakes that were once ruled by a black dragoness, Ayla. She has since disappeared into the blizzards; none know of her fate. Long ago, arctic kitsune also roamed these lands, but the line is now extinct, obliterated from the face of history by some mysterious, catastrophic event. Not many who wander into this land last long; those who seek its solitude are desperate indeed. Hidden deep in the southern Darklights lay a small tunnel about eight feet tall; surrounded by red sandstone and sparse desert flora, what lay within is concealed in the shadow of the Cavern's entrance. Once inside, the walls begin to crystallize five or six feet in, until they are formed completely of smooth, glittering quartz. This expands after the tunnel curves and extends inwards another sixty feet, widening into a chamber large enough to house several dragons at once. White quartz and opal swirl in the walls, and spires of long crystalline stalactites hang longest in the center, reaching for a wide pedestal made of flawless marble. Inside these walls, images may be glimpsed from the corner of one's eye of other worlds barred from mortal touch. And through these images, the gods can connect to their Realm no matter where they are, so long as someone with a fair heart listens. The waters of the Great Lake, the Hidden Waters, are fabled to be the purest anywhere in Felnova, blessed by the gods. A haven for dragonkind and its kin, those seeking to do its inhabitants harm face not only an illusion that hides the lake as seamlessly as if it never were, but a barrier erected by Kazule long ago fashioned like an invisible bubble miles and miles overhead. If one of dragon blood - or one who seeks safety and means no harm to the scaled race of old - approached Hidden, the illusion will evaporate like a mirage on the desert sands, revealing endless plains of grass to be a shimmering mirror surrounded by great cliffs, spreading trees and wide, wonderful beaches. At the bottom of this great lake lay a cavern as old as time, with a secret treasure guarded by an age-old basilisk who needs not the light of day. In the far northern reaches of the Frozen Wastes lie small, icy islands; it is said that here, the cold bites deeper than anywhere else in the Realm. Under the islands exist a complicated network of caverns and tunnels; few have ventured to the deepest of these and returned alive to tell the tale. As the name would imply, these islands are inhabited by the worst of criminals and the ice dragons that guard them; being sent to these isles is for all intents and purposes a death sentence, and it is said that the land and the tunnels below echo with the vengeful ghosts of those who died here, in utter exile from the rest of the world. Ramaloke Ridge was named after the great Dragon Mountains in Millirand; this was where those fleeing the destruction of Ki-Lia built a new country, where they constructed the great fortress-city of Albronel. Towering over the Plains and even the Darklights to the east, it stands like a watchful sentinel over all of Vystriana. Consisting of a dark, grey stone, its forested sides render many caverns and caves, some stretching far deeper into the mountain's heart than any dragon dare venture. Dwarves from other Realms often come to Albronel to mine in the Ridge's depths, delighting in the rich ore and beautiful gems they find there. Hidden within the Darklights between Godshome, Majestyand the Gods' Cavern is a valley known as Sanctuary, where there is an orphanage run by “Granny” Ning Su. Capable of holding over a hundred children with a staff to match, it is difficult for people to randomly stumble across it, as the trek is harsh and dangerous. However, wandering sentinels roam the mountains to find those who are desperate to make the trek in order to leave found children. For those that seek to befoul this sacred place, they often have well-armed warriors who would give their lives to keep the denizens of this place safe. The children are taught basic life tasks and trade skills to make it out in the world - though some choose to stay to offer other children rejected by the world the same chance they were afforded. Named for the legend of the five-hundred-foot-long sea dragon that once lived in these waters, this beautiful place is where one of the offshoots of the Skyfeather meets the ocean. The cliffs that tower above the sandy beaches are riddled with caves full of crystals and moss of every color. This is a popular nesting spot for amphitheres, cavewyrms, basilisks, and wyverns to this day; perhaps it is due to the population of the snakelike creatures that gave rise to the legend of the great sea snake. First named by a dragon on the wing; from the air, it looks as a beautiful streak of blue running throughout the north and west of Vystriana, thin and soft as a filament of down. But the truth is revealed once one gets close; this broad river is notorious for the rapids that take travelers by surprise, as well as the brief, slow-flowing current between the whitewater that lulls one into a false sense of security like a siren`s song. Near the heart of Vystriana, the river splits into three; one branch winds north and meets the ocean at Serpent`s Cove, while the southern Skyfeather feeds the legendary Hidden Lake and continues southwest through the Song Forest. The main body of the river, however, continues straight west and becomes a marshy delta that supports a surprising amount of wildlife. Often called the Forest of Song or Linath's Greenwood, this beautiful forest stretches along the western shoreline to the edges of the vast Exodus Desert. Beneath its boughs grows all manner of life, flowers and plants never seen in any other place. Within these trees, faeries make their homes and kirin crop the grass, harboring any who seek protection. A river that begins in the springs of the Ramalokes cuts a path to the south, and the elven cities of Coia and Vanim are located amidst its trees. On the northern edge lay the great Soultree, and in a mile in every direction from its split trunk faded souls may be seen flitting about at night, glowing brightly with the color and life many once held. Located up in the northern Darklights, Talon's Peak is so named after the thirdborn son of Fang, called Talon, a courageous Brown who wove a spell to disrupt three Markers in an attempt to stop more snakekind from pouring into Vystriana via portals. The sheer energy it cost nearly killed the young dragon, but it allowed the dragons and their allies to fortify Albronel before the full brunt of Snakra's invasion struck. Beneath this Peak, the first Marker lay; Zacyn's Cavern it's called, for the former god held a sacred beryl in the guardianship of Jekt for nearly fifteen thousand years. Located just within the border of Linath's Greenwood - Song Forest, to most - the Tree is a link from this world to the realm of the dead. The monarch of the forest is cloaked in white wood in a forest full of green, and its mighty branches reach higher into the sky than those of any other tree, silvery leaves trailing nigh to the ground like a giant weeping willow. In the middle of the trunk, the knotted wood twists into an oval hollow; a window into the Spirit Realm. Though the veil that separates the Spiritual Realms from those of the living, the Soultree is a place where any may come to see and speak with the spirits of the departed, remembered or forgotten. This great, glittering body of water separates Vystriana from the rest of the world on its western side, and is populated by a countless variety of species from graceful merfolk to the brazen narwhal. It has been known to be difficult to cross, as the waters are fickle and can stir into a frenzied storm without warning. It is said that the sudden typhoons are caused by the mysterious kingdom of Yorjie; the empire of the sea dragons. There is nary a place to rest when crossing the ocean, save for a few uncharted islands. Realm of beauty; of dragons; of the elements themselves. Felnova, Kinniokza, Adduli'in: the world that balances Kurai on the ethereal scale has many names, though the draconic and elven ones are very little used. A land of wild beauty and incomparable power, and one of the most fought-for Realms in our section of the Void today. Strangely enough, Felnova's beginning was one of chaos, and its fate is tied directly to the dragon royals of Vystriana, with great and terrible consequences to hit should they be removed from power by anything but their own volition. The atmosphere follows the same path that many of the discovered Realms do; in it lays a potent reiatsu surrounding the planet, unseen and rarely felt. It cancels out the electricity and components of anything too technological, such as the wildly advanced machines of the destroyed Earthrealm. At its heart lay the Realm's first Ether, and her purest white reiatsu flows within, invisible but in dire need. Her magic flows through the air and earth equally; when damage is done, it is repaired very quickly, letting the Realm recover in months to the normal few years. Realm Contributors: Verridith, Fyfergrund, Darkeh, and Drifter.